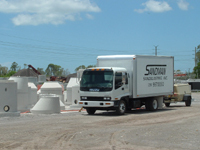 Serving all of SW Florida, Sandman Sandblasting is an on site sandblasting service capable of residential, commercial, industrial & marine applications. "Sandman Sandblasting Inc. is a family owned and operated mobile sandblasting service. Our pride in ownership and dedication to providing our clients excellent service is reflected in the professional, innovative and quality oriented manner in which we conduct our business." We specialize in sandblasting clear seal & paint off of Driveways, Walkways, Patios & Pool Decks. Stamped, Stained or Sealed Concrete! "I want to commend you guys for a job well done. We are very happy with the results."